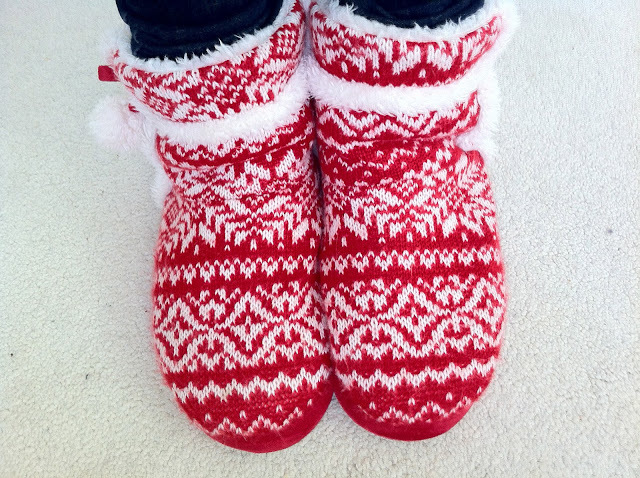 I have "this years" slippers and gosh they're snuggly. It's like a hug for each foot! I can now go between my sheepskin boots and fluffy slippers without having to have a cold foot again! This is such a confusing photo. Blue sky and autumn leaves (it was cloudless earlier in the day, but I was cold lazy and couldn't get my bum off the sofa. But oh so cold. Freeeezing, in fact! Is it Autumn or Winter? I have no idea...my mind is still boggled over where summer went. Howard has a friend staying (and, with him and the little man, my poor sofa could do with some tlc.) Our lovely red head guest was meant to be staying for a couple of days and I can't tell you how excited Howard was to see her...let alone have her to stay. A couple has now turned to 14 days and no noise as to when she's going to be picked up. I'm thinking maybe I could claim "squatters rights" now and keep her when my friend does decide to collect her. She really is a lovely girl. Howard is acting like a petty child though, and every time Jess picks up a toy, he immediately drops whatever he has and won't have anything but the item she has! He really is a terrible host. We've had a poorly little man over the past week, who has decided that mummy is the only place to be. This has hindered my life quite a bit, from simple acts like making a cup of tea/coffee or going to the toilet, to doing housework and sorting out the five BILLION boxes of stuff I need to sort through from the move. God I'm such a hoarder! Thankfully it's looking up and my normally smiley man is feeling less like a grot-bag.